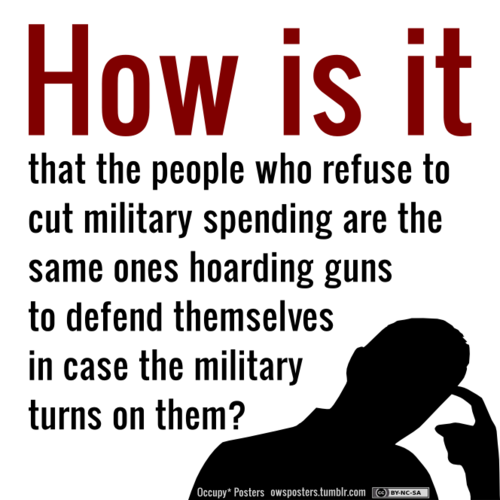 The phrase "pro-gun, pro-military" is used by some conservatives to describe themselves, as if the two go together seamlessly. For example, activist and political candidate Erin Cruz states she is both "Pro Second Amendment" and "Pro Military" in her promotional materials. Another Republican candidate, Gregory Duckworth, advertises that he advances "pro-gun and pro-military initiatives." And last year, Donald Trump, Jr. — as part of a controversy over Keurig coffee pulling its advertising from Sean Hannity's show — denounced Keurig and endorsed Black Rifle Coffee, which is advertised as a company with a "pro-gun and pro-military stance." The Second Amendment wasn't written so you can go hunting, it was to create a force to balance a tyrannical force here. Given that the US military is one of the primary means by which the US government can exert its own coercive force, it seems a bit odd to think that one can simultaneously be "pro-military" while also being for gun rights designed to "balance a tyrannical force here." The US Navy is about ten times bigger than the next largest navy, which happen to be its close ally, the Royal Navy. The United States has four air forces, one for each service, and all very capable ... the US Army has dozens of powerful brigade combat teams and dominates potential rivals in any form of conventional warfare. The US Marine Corps is much bigger than any comparable force. And US special operations forces are about the same size as all elements of the Canadian military. If one is concerned about providing "balance" against abuse of government power, it would seem that pushing for a few more AR-15s in private hands isn't really going to make a critical difference. The fact that many Americans today think it is possible to be both pro-Second Amendment and pro-military at the same time would have struck many Americans of the Revolutionary period as exceptionally odd. After all, at the time of the ratification of the new Constitution — and the writing of the Second Amendment — Americans were notable for their opposition to a permanent and powerful military force — especially in the form of a so-called "standing army." Greatly distrustful of putting military power in the hands of the federal government, the authors of the Second Amendment advocated instead for a far larger decentralized and locally controlled militia. Thus, in the nineteenth century, both state and local militias greatly outweighed federal military power, and it was assumed that any large standing force would have to be composed of state units supplied by state governments. In practice — until the late twentieth century — state governments could veto these deployments. Even state militia power was suspect, if it was full-time and professionalized. Thus, the concept of the "unorganized" militia retained significant support even into the early twentieth century. Today, however, these checks on federal power have been abolished, thus that which is "pro-military" is now necessary pro federal military. Nor was this opposition to a national army unique to the Americans. The concept had already been well-established in English politics going back at least to the English civil war. At the time, opponents of unchecked monarchical power supported and obtained a decentralized non-professional militia system designed to partially supplant a standing army under the control of the king. This later proved to be a significant issue during debates over the ratification of the new constitution, as many Americans felt the new reforms placed too much power in the hands of the federal military. As historian Anthony Peacock observed, "the anti-militarism of Americans during the founding period presented a significant problem for the federalists who wanted a larger, permanent army." In the US, as in England, the proper role of military power consisted only in protecting lanes of commerce and in a strictly defensive military. In their minds, this did not preclude a large and strong navy, but it did preclude any nationally-controlled military force capable of occupying cities and enforcing the will of the central government. the people organized in the state militias were regarded as a counterforce against the threat that the regular army could be used as an instrument of oppression and service in the militia was a right of the citizen that could not be transgressed by the federal government. Needless to say, such a proposal is unlikely to gain much traction with many Americans who consider themselves defenders of freedom via the Second Amendment. Consequently, the ideology behind the "pro-military" mindset has destroyed the anti-militarist and decentralist vision of the Americans who fought for and won passage of the Second Amendment. This situation would be unrecognizable to a Patrick Henry or a George Mason who had advocated for a strong independent militia system to offset the power of the federal military. Perhaps the final nail in the coffin came with the Montgomery Amendment which removed a state governor's ability to veto the federal governments ability to federalize National Guard troops and send them overseas. Enraged by the idea that a state "militia" unit was able to act with any independence, pro-military Senator C.V. Montgomery authored and ultimately passed his amendment which removed the final remnants of state control over what were by then barely state militias at all. This destruction of the militia system — a system going back to the Revolutionaries and the English libertarians before them — struck at the core of the Second Amendment.The Amendment still legally protected some private gun ownership, but gone are the foundations built on the premise of federalism and decentralization in military power. Instead, all that is left is the notion that some untrained civilians with non-military-grade weapons can offer a "counterforce" to the US military. What private gun ownership there is, of course, is better than nothing, but thanks to the "pro-military" mindset of people also claiming to be "pro-gun" the Second Amendment is now a hollowed out shell of what it once was. 2. This is a very conservative estimate that ignores both reserves and the National Guard, both of which are de facto federal forces. 3. See: David Yassky, The Second Amendment: Structure, History, and Constitutional Change, 99 Mich. L. Rev. 588 (2000).